Next I stamped the sentiment, also from JustRite's Elegant Frames set, on white cardstock and cut out the beautiful tag shape using JustRite's custom Spellbinders Nested Frame die template. After securing ribbon to all four sides and tying a luxurious bow on top I finished my project with a beautiful oversized butterfly, also from Spellbinders. One of the fun techniques that can be achieved with the JustRite custom die templates is called the letterpress technique. Start off by appling ink directly to the die template. Carefully flip over the die template onto your cardstock and secure with a strip of tape. Cut/emboss the tag. Once you remove your shape from the die template you will have a beautiful shape with perfectly inked 'letterpressed' edges. 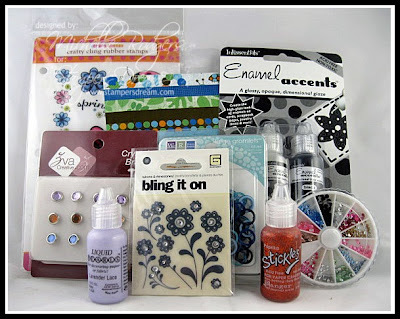 Along the hop JustRite Stampers have 3 great blog candy prizes hidden! No one knows where the blog candy is! For your chance to win one of these three prizes simply leave a comment on each blog. Blog comments will remainn open until 8 pm CST - Tuesday March 22nd. The 3 winners will be announced on the Stamper's Dream Blog and the JustRite Blog on Wednesday March 23rd. $50.00 Shopping Spree to the JustRite Webstore. This box is just elegant, especially with that lovey butterfly on that bow. What a beautiful box, like a gift within a gift. This is sloop pretty, love the butterfly. Oh my goodness, I love this idea. The butterfly is beautiful on top too. Thank you so much! What a pretty way to dress up a gift! The little medallion makes the box so pretty. I will have to try the technique as well. Looks so easy to do but makes such a great impact. Simple and elegant statement wrapped up in one! wonderful! and the butterfly is just the perfect touch! Amazing gift box Kazan - Someone is going to be happy to receive this! What a lovely box, such an inspiration. Good enough to give on it's own! This is so cute! I can definitely see myself copying this one. this is sooooooo nice, wow, thanks for the die tip. Amazing! Simply beautiful and delicate and gorgeous! Oh my goodness! Love the "How To"! Beautiful butterfly! Beautiful gift box. The butterfly is a beautiful touch. Oh this is just beautiful! I have never tried that technique with the dies, how cool! Thanks for the inspiration! This gift box is stunning! How will the gift inside compete with this beautiful box? Beautiful, Kazan! Love the letterpress idea! TFS! Love your project!!! It is so clean and simple, but elegant. Thanks for the tip about making the tag look letter-pressed; I will definitely try this!!! What a lovely box,the butterfly just takes it over the top. Beautiful package! The butterfly and sentiment...wow! This is an absolutely perfect project! Just the right amount of embellishment to give a look of restrained elegance. Definitely a favorite! OH WOW! I love this gorgeous gift box. And thanks so much for that tip with the die! I can't wait to try that! What a beautiful piece - lovely to look at and to keep a special something in. So nice to see stamps and dies used for something besides a card....what a beautiful package. Thank you so much for the tip on the letterpress technique. Oh this is so beautiful. I'd love to get a package dressed like this! Great gift box! The colors, the ribbon and the butterfly -who would not love to get this! Love'n the butterfly and the sentiment label. Kazan, your box is really gorgeous! Love the way you used the letter press technique with the die...thanks for the instructions and pics! And your butterfly is the perfect touch! What a fun way to send a gift. I love it. Love that butterfly! Lovely way to give a gift. Such a beautiful box. No need for a present! Your project is beautiful! The butterfly adds just the right touch. Such a pretty decorated box Kazan. Love the colors... the pretty ribbon is perfect. WOW I really love this box. Wonderful idea. YOU did a beautiful job. Thank you. Beautiful, Sweetie!! Love the ribbon! Great job! Ohhh, I love me a great embellished package!!! So lovely, terrific and wonderful, Kazan! Thanks for sharing the how to, I will have to try this! How could you ever find anything to put in this box that is more fantastic that it is? Great job! The box is beautiful. Thanks for showing the details. this is so cute. thanks for sharing the tecnique with us too. This is gorgeous! The clean white with the splash of color--really sets the stamped image off. Beautiful. Thanks for sharing. Such a pretty little box. Thanks for sharing and the info on how to do it. Oh what a beautiful gift box. I love the ribbon and the butterfly is just a perfect accent! This is a beautiful box! Love your work. Thanks for sharing with us. What an exquisite gift box -- WOW!!! I LOVE it and all the new releases from JR!!! thank you for the wonderful gift box creation with end of the school year teacher gifts coming up this has truly inspired me ! Love, love the butterfly. Your creation is just top flight. Just Rite should be very proud of you. Thanks for sharing. Hugs. Very nice job Kazan. Love that butterfly too. Love your box, such a great way to make a beautiful birthday presentation. What a lovely box! I'm going to try that die inking process today. Thx for the inspiration. Your tag on the box is lovely and the letterpress technique is new to me!Thanks for explaining. Ohhhh myyyyyyyy AMAZING! What a GORGEOUS project Kazan!! a gift within a gift that's for sure! just lovely! thanks for sharing! Wonderful box and beautiful colors! I love your box. Thanks for the quick tut. love the bow & butterfly. Oooh, how very pretty! Really like the way you have accented the box with that lovely bow and then complimented it with the butterfly and labels. Thanks for sharing! Wow! With a box that beautiful,who needs presents! Simple, clean and beautiful. Very nice. Love your box. So pretty with the butterfly on top. what a beautiful gift to present to a friend. I will be honest....if I made that beautiful box I dont know if I could give it away.....it is a work of art. I almost fell off my chair at the gorgeousness (not sure that's a word, but this box deserves a NEW word) of this box!!!! FANTABULOUS job!!!! And thank you so much for showing us the Letterpress Technique!! I appreciate it, and am going to try it out today!! 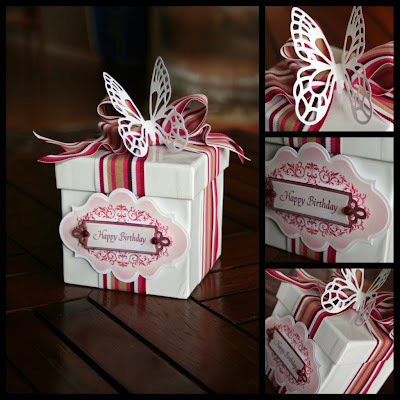 I just love making and decorating boxes and yours was just beautiful with the butterfly accent too! Oh, WOW! This is so gorgeous! I really love the label! Beautiful! So Pretty....love the elegant frames and the butterfly!!! thanks for the tip on inking the Spellbinder template. That's a new one for me. This is beautiful. Now I need to find that white box and lovely ribbon. Beautiful job as always. I love Just rite stamps and I like the letterpress technique you showed. That's one I've never seen before and I really like that idea. Thanks for all the beautifule cards and inspiration. What a fun box and so beautiful! Love the box - and thanks for the techniques - I have seen this before and always forget about adding ink to my dies! This is so cute, Kazan! I love the butterfly topper! Great job! Kazan your work is beautiful. The box is gorgeous! Thanks for sharing. What a gorgeous box. Love the butterfly, it is so intricate. Such a beautiful gift box. Love the butterfly and the tag. Thanks for sharing. Oh my Kazan this looks to perfect to be really made by hand! :-) I love it! Wonderful talent in those hands for sure! Thanks for sharing! Wow! I love this creation the label tag really just shows it off ! Thank you for the How-To! I think that is a fablous idea! Thanks for sharing! Gorgeous box... Love love love it. I have never thought to ink my nesties! What an awesome idea! I love how it turned out. So very pretty. Thank you for sharing! So pretty! The butterfly looks amazing. Fantastic! Wow!!! Who wouldn't love receiving this gift. GORGEOUS!! I love these new stamps! Thanks for sharing, the inspiration and the chance to win! This is just darling ... love the butterfly on top!! Wow! Your box is stunning! I absolutely love that butterfly! Very cool idea to letterpress the shape!! Beautiful!! I can't wait to get home and try that letterpress technique with my existing Spellbinders! Thanks so much for sharing. I love this gift box and the letterpress technique. I will definitely be using this technique. I have to get that Butterfly from Spellbinders too. OMG, what a gorgeous and elegant gift box. I love it! Love this box! Just beautiful! What a wonderful gift box Kazan. I love how you used the JustRite stamps. What a beautiful boxe for little present! for a little girl! or a teen one! Absolutely jazzy. I just love yoour ideas, what a great idea for jazzing up a box. Thank you for sharing. This is great! A unique way of using these designs on something other than a card. I wish it were my birthday!! I love your box; simple but elegant! Thanks for sharing! 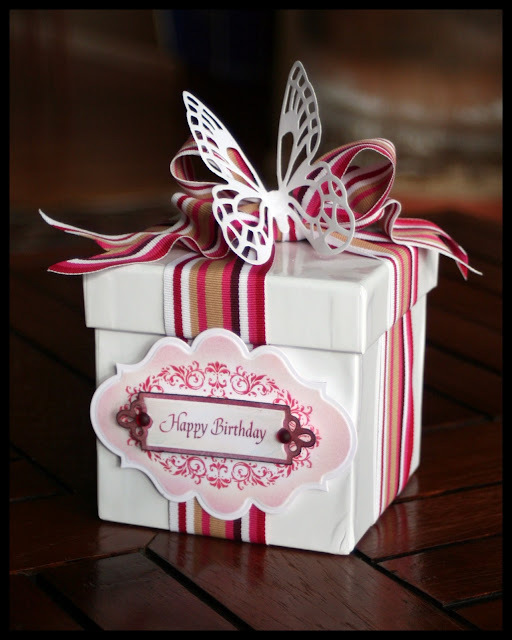 Beautiful box, love the ribbon color and the way you brought it into the label, butterfly is gorgeous! Hi Kazan! LOVE that package! And thanks too for the tutorial...I'd never have thought to ink it like that. Such a pretty card to add to your package, a keeper for sure! Wow, that's a great tip on how to use the dies in a bit different fashion. Thank you Kazan! Gorgeous gift box! Love the butterfly on top! And thanks for the tutorial! What a sweet little box!! I love the colors and that butterfly is just the darlingest!! WOW - what a beautifully decorated box - who would not love receiving something like that. I love the butterfly die - I have one from Spellbinders but this one is great - so open and lacy. Just love it. Wow, I need to review the way I wrap presents. This nis like getting a present twice! WOW - just love a pretty gift box!!! This is so lovely. Thank you for the tip on coloring the edges. Didn’t even think about that. I have a craving for Alterable items...boxes, tins, bottles, etc. This is right up my alley! TFS!! Kazan it is absolutely Gorgeous!!! I would have a hard time opening such hogs us gifts ! This is a awesome creation. Now I have to get my tools and make me a box. Thanks for the inspiration. I just love it, the colors, butterfly, bow, ribbon, elegant package. Kazan, this is so pretty - what a cute idea! This is just super gorgeous. What an elegant box this is! Very simple yet super elegant!! uuuuooohhh! so pretty! love the big butterfly. You have an awesome blog--I am signing up to follow! How cool is this?!! I especially like how you dressed up the bow with the addition of the butterfly. Beautiful gift box, and love the butterfly. Kazan, Love the gift packaging. It is pure elegance. Love the JustRite stamps, sentiment panel ribbon and of course the beautiful butterfly. Don't you just love Just Rite stamps? I sure do! wow, what a nice box! Beautiful work! This is to die for! So dreamy! Thanks for the inspiration! Simply stunning...I love how you make things look so perfect whether they seem to be exceedingly complex or simple. You rock!! Who wouldn't want to receive that gift? Love the butterfly accent, too! How creative you are. Thanks for sharing the tip about inking the die I often wondered how people managed it never dreamed of doing it that way. First time visiting your blog. You do amazing work. Love the box all done up with the ribbon and butterfly!! Thanks for sharing!! I hope I win some of this Justrite product. Wow what great blog candy. Thanks for the great blog hop too. Really neat tag. I like how the inside is inked vs the usual outside. Really clean lines. Great idea! This is a wonderfully executed project. Such a great use of the elements. and to think it all started with a white box . . . stunning!!! Great box--I like the letterpressed technique. What I nice and easy project, and yet it looks so elegant! What a creative way to present a gift. The box is just as beautiful as what may be inside. Thanks for the tip on the letterpress technique. I have been wondering how I could do this, as I usually am not terribly successful at using the Krylon pens to outline the edge in color. I'll try this next time. Very elegant frame Eva, and that WOW butterfly! Really beautiful design, love the butterfly! Really lovely. A great presentation. This is absolutely beautiful. I love the butterfly and the ribbon. Thanks for sharing. Your box decoration is lovely! hey sweet Kazan, I adore this little box, over the top sweetness! Awww It is so gorgeous!! Love the colors and everythig about it. Glorious box Kazan, drooling over that buttefly, so good to visit! Stunning box! The label technique is wonderful. Thank you for sharing. Kazan your box is outstanding- thanks for the idea about letterpressing but love your project. that gift box is stunning! It literally made me say wow...my husband looked at me like something was wrong...LOL...thanks for sharing the tip about the letterpress look...who knew? Beautiful gift box!! Love how you used the letterpress technique & that bow is fabulous! The colors are so rich - what a beautiful card and thanks for the tutorials! I love this box! Just my style!! thank you for the letterpress idea...fabulous inspiration and the directions....gotta luv it! Your HB day box is gorgeous. that butterfly die is calling my name!!! What a lovely design - gift box with the butterfly will go especially well with a card I'm planning on making for someone special.....Thanks so much! Glad I decided to hop after all!! What fun! What a beautiful gift box. I absolutely love it. Love your project, very pretty. The box is gorgeous.... love the label and stamp! i love it! too cute!! What a wonderful project using JR stamps.... Thank you for sharing the letterpress technique!!! Thanks for sharing! Lovely way to present a gift!! TFS! Such beautiful things today. Love it. Absolutely stunning just like you and ALL your work! What an adorable package. The butterfly is gorgeous. Anyone would love to get a gift in this pretty box.